"It is a book that provokes all educators to think more deeply about what literacy education is for-to pass tests and 'move up,' or to help individuals value themselves as literate individuals". "Through her work, Rogers challenges researchers and educators to not only recognize the power of language, but to take a course of action that eliminates the lack of agency and autonomy felt by people who are not afforded the privileges of those who have access to the language of dominance". 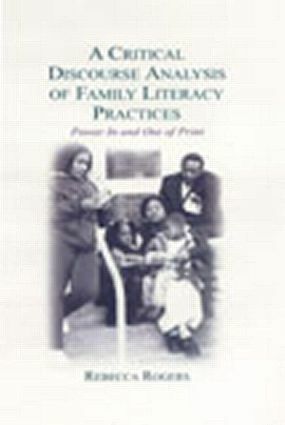 "…this is a unique book, which deftly combines Critical Discourse Analysis (CDA) with ethnography. It reveals the value of CDA, and how it can throw up analysis of power in relation to the concept of orders of discourse. Rogers also offers a methodological argument for offering one case study as a 'telling case' and gives the qualitative research argument a stronger case by describing such detailed, high quality research." "Rogers powerfully demonstrated the injustice of holding up the so-called right kind of literacy as the measure of competence and success in life, thereby severely hindering people's ability to increase control of their own social circumstances." "[To] paraphrase Rogers' own words just a bit: how does the 'sticky web of institutional discourse' hold certain sorts of people, often people with the least power and opportunities in our society, 'in place despite ample commitment, persistence, and cultural capital' on their part? Her book makes a signal contribution to addressing this problem." "This compelling and powerful book makes a significant contribution both as a model of ethnographically grounded critical discourse analysis and as an analysis of the role of historically and discursively constructed subjectivities in perpetuating oppression and injustice." Contents: J.P. Gee, Foreword. Preface. Introduction: Participants in the Study and Theoretical Orientations. Methodology. Personal and Institutional Histories. Family Literacy as Apprenticeship. "I'm Her Mother, Not Them." Into the Meeting Room. Through the Eyes of the Institution. The Paradox of Literacy. Appendices: A Brief History of Education in Albany. Data Collection Timetable. Fieldnote Chart. Document Summary Form. Chart of Critical Discourse Analysis Definitions and Codes. Snapshots of Vicky's Remedial Reading Lesson. Committee on Special Education Meeting Transcript. Role of the Researcher.